A guide for all GSD lovers and anyone who is thinking about getting one. Disclaimer: I don't pretend to know everything, I'm learning as I go along. Comments, ideas and nitpicks are greatly welcomed. The German Shepherd Dog (GSD) quite obviously originates from Germany. The GSD was originally bred to be a working dog but over the years they have become more popular as guard/police dogs and family pets. GSDs are not an old breed. They were first shown in 1882 but were not the types of GSD we are used to seeing today. They had mongrel-like features, were rough coated and had small tails. 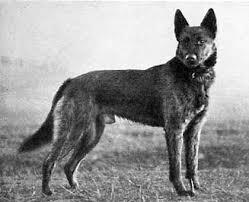 They were bred more and more over the years and the GSD you see today appeared around the second World War. You may have heard of Alsatians. They are not a different breed. The GSD and Alsatian are one and the same. You won't believe how confused people get about this. During World War 1 and 2 they were named Alsatian Wolf Dog because it was believed that German Shepherd Dog would harm the breed's popularity (remember the world they lived in at the time). 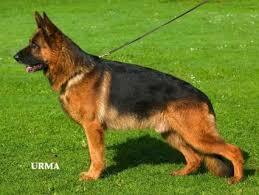 The official breed name in German is Deutscher Schäferhund but just stick with GSD/Alsatian if you don't speak German. Who Should Own A GSD? Tips For Separation Anxiety - Coming soon! Is yours a pure gsd? I've never seen a black one..
2009-07-20 [Zab]: Ours are broooownish xD well, I've seen a few white ones but most are like this Never heard of other than that and white..
2009-07-20 [sequeena_rae]: Sky came from black and tan parents. It depends on the gene. [Artemis Riddle] has a black/red, I know someone with a longhaired white and you can also get liver and blue :) Black/tan is just the breed standard for showing. I like them tho. They have good heads. 2009-07-21 [sequeena_rae]: I agree though there are still some lovely working lines (Sky came from brilliant working parents). It's the show lines I'm worried about and the fact that people are breeding them without taking any of the necessary health tests. Hip/elbow displasia etc. The police is breeding their own shepherds, or changing breed. I dislike selected breeding.. most cases it ends up more and more extreme and that's never good,.. especially now when we don't really use our pets anymore. 2009-07-22 [sequeena_rae]: Reputable breeders only breed from good stock so there should NEVER be any problems (of course animals will always get ill, just like us). I'm more concerned about the judges at the shows.. if they hadn't rewarded the extreme -tha's even out of the breed description - there wouldn't be much people breeding it. I love these dogs, some of the best dogs I've met has been german shepherds, and our Ceddie is part gsd.. But with how they're bred toay, I wouldn't dare buy any..
Yours look healthy enough tho. 2009-07-22 [sequeena_rae]: Show breeders are the worst I think. My girl comes from working line stock, best dogs to always go for! 2009-07-22 [Zab]: It's not just the standing position, I've seen too many live..
2009-08-02 [de Morte]: Oh, according to the vet I work with, the difference between a German Shepherd and an Alsatian Shepherd is in the size, we had a Alsatian in today, his proper weight is 100 pounds and his back is about 40 inches tall.